NEW YORK, NY--(Marketwired - Jun 6, 2013) - The Honorable Mrs. Marta Linares de Martinelli, First Lady of the Republic of Panama, has accepted the invitation to be the Honorary Chair of the International Center for Autism Research & Education, ICare4Autism. Marta Linares de Martinelli was honored for her pioneering efforts to alleviate autism at ICare4Autism's 2012 International Autism Conference in Jerusalem. In May 2012 the First Lady created Panama's first education center for people with different abilities, Centro Ann Sullivan de Panama (CASPAN). Designed in the model of Dr. Lilliana Mayo, Ph.D., the center is an inspiring, comprehensive approach to educating people with different abilities for full societal inclusion. Dr. Joshua Weinstein, Founder & CEO of ICare4Autism, had the privilege of visiting the center this March. 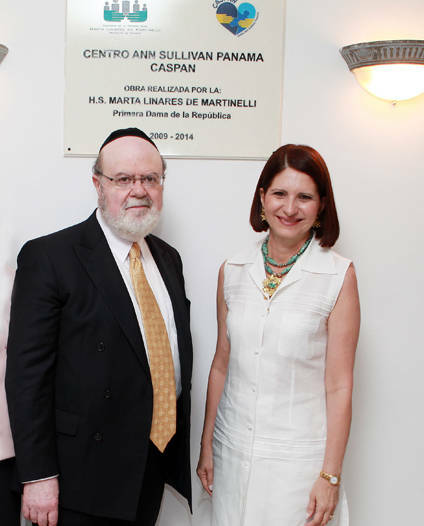 Upon meeting the staff and children of CASPAN and partaking in the center's programs, Dr. Weinstein remarked, "The First Lady has taken leaps and bounds to advocate and educate Panama's people with different abilities. I am honored to call Marta Linares de Martinelli a friend and believe our partnership is the first step of many great strides for the treatment of autism and similar disorders worldwide. I look forward to sharing strategies and successes with the caring community at the Centro Ann Sullivan de Panama." The Founder of ICare4Autism and the First Lady of Panama discussed sharing staff-training procedures and the possibility of replicating ICare4Autism's upcoming Autism Conference for Pediatricians in Panama. Mrs. Marta Linares de Martinelli said, "We have to work closely with ICare4Autism to ensure the success of our programs... autism in Panama has become a matter of state policy." She expressed her eagerness to begin collaborating with ICare4Autism as there are great things ahead and much work to be done. The International Center for Autism Research & Education, ICare4Autism, is a New York City based non-profit organization that works to discover the etiology of autism and to serve the global autism community by promoting and implementing research-proven medical and educational intervention strategies. ICare4Autism's mission is to act as a catalyst and drive research worldwide.